The weekend is almost upon us so it’s time for our weekly round up of the best local talent that you can see live this weekend. We’ve spotted two great gigs on Thursday night – Tiny Dragons are playing at Club Criminal at Latest Music Bar, with support from Fools Knowledge, Dead Whisky and Dress Theque. Round the corner at the Blind Tiger The Resonators headline Dub Organiser. 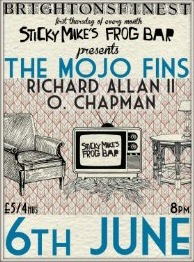 On Friday there are a crazy number of local bands playing live in Brighton. The biggest show is at the Dome, where the Levellers play Brighton for the first time in ages to celebrate their twenty fifth year as a band. Support comes from Electric Soft Parade. 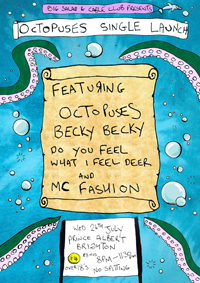 Friday night also has two gigs by Brighton bands at the Blind Tiger. Early doors Standard Lamps and Calico are on the bill, and later on from 10pm The Impellers play their own gig. Meanwhile The Meow Meows are holding a launch party for their album at The Gladstone, and Emberhoney, Mishkin Fitzgerald and Simonne (without her Dark Stars) play at the Komedia. Just a few miles out of town, British Sea Power play at the Gentlemen of the Road Festival in Lewes. The rest of the weekend we think you should be out enjoying the sun, stopping only at the end of the weekend when Brighton Folk hold their regular night at the Brunswick with Dave Blackwell topping the line up. This weekends gig picks come in the form of two festivals – one taking place just up the road in Glynde near Lewes, and the other taking place in the Druids Arms by the Level. 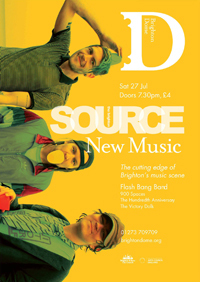 Meadowlands features dozens of Brighton bands, so I’m not going to try and list them all. It’s a weekend festival with camping, so fingers crossed for the weather. If we were going, we’d be making a bee-line for British Sea Power, the Physics House Band, Interlocutor, Clowns, Bent Cousin, AK/DK, Kovak, and Nordic Giants. If you like your festivals a bit more local then Nice Weather for Airstrikes Festival, now in it’s fifth year, could be more your cup of tea. The line up is headlined by Shrine, Codes in the Clouds and the Hundredth Anniversary over three nights. 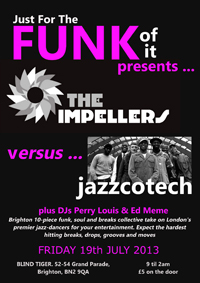 Finally if festivals aren’t your thing, then on Sunday night The Impellers play a late night funk and soul gig at The Warren.